Camping La Sal National Forest is Awesome! 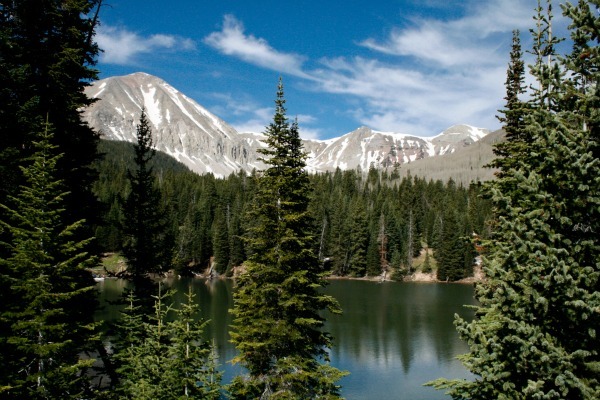 Experience Camping La Sal National Forest. Dark Canyon Lake along Geyser Pass Road. 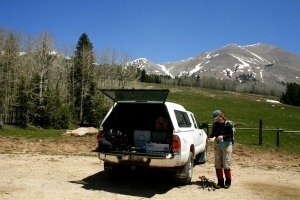 Camping La Sal National Forest is a great place to go to get away from the hot summer days of Moab. There is everything from Canyonlands and Arches National Parks all the way up to cooler Alpine climates only 35 miles from town. In a very short distance you can go from Moab 4,000 ft (1219 m) up to La Sal Pass 10,100 ft (3078 m). If you’re interested in doing some hiking, you can do that too. 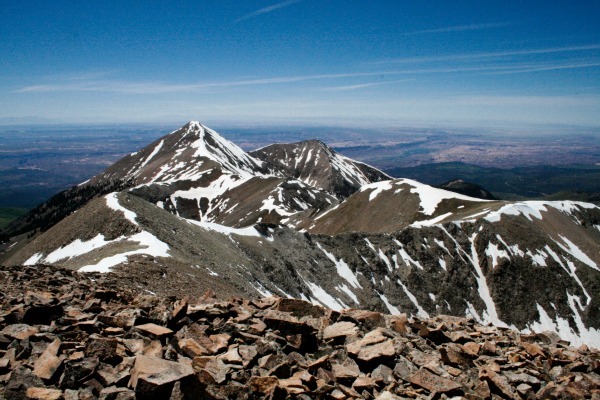 Mt Peale, the highest mountain in the range, stands at 12,721 ft (3877 m). That’s 8700 ft or 2652 m higher than Moab. The views from there are amazing in every direction. Aspen grove on La Sal Pass. 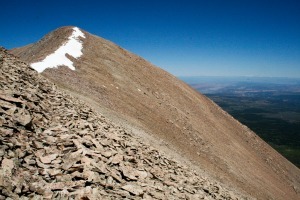 There are 12 peaks in the La Sal Mountain Range over 12,000 ft, which is all part of the Manti La Sal National Forest. Being next to the desert it’s hard to believe that snow is there year round. Camping La Sal National Forest. Almost the entire area of the La Sal National Forest in located on public lands. That means you can go free camping just about anywhere. East of the La Sal Mountains are areas of private ranch land. Those areas are well marked so it’s quite obvious whether the land is public or private. Our campsite along Geyser Pass Road. On the west side there are some areas in the foothills and of course near Moab where camping is not allowed. 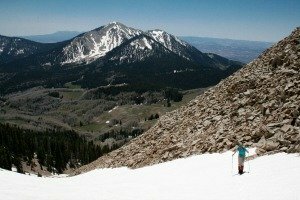 But, overall the possibilities for free camping La Sal are endless. 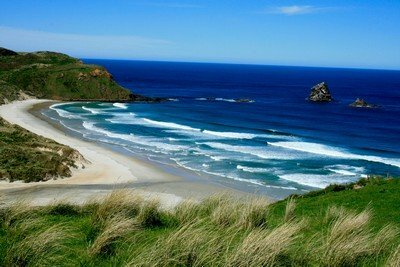 Most remote campsites in that region have no water so you’ll need to bring enough of your own. Rather camp in a public campground? 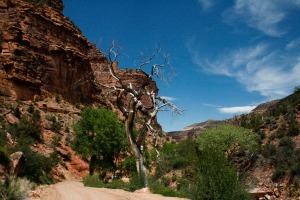 In the La Sal Mountains southeast of Moab are two campgrounds. One is Warner campground, the other is in Buckeye Recreation Area. 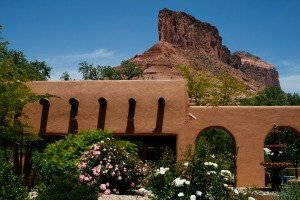 Warner is located about 30 miles from Moab and has about 20 campsites and a cabin to rent. The campground is situated in a large aspen grove next to Warner Lake at over 9000 ft. I think it would be a beautiful place to camp in the fall when the leaves change color. The campground at Buckeye Recreation Area is located just across the Colorado State Line on the east side of the La Sal Mountains. 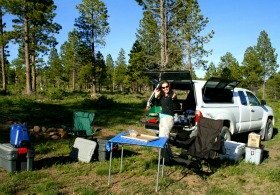 It has about 30 campsites next to Buckeye Reservoir and offers great views of Mt. Peale and a few other peaks. 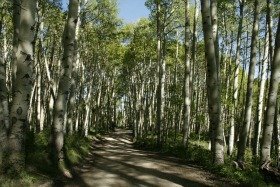 Go for a hike while you are camping La Sal National Forest. 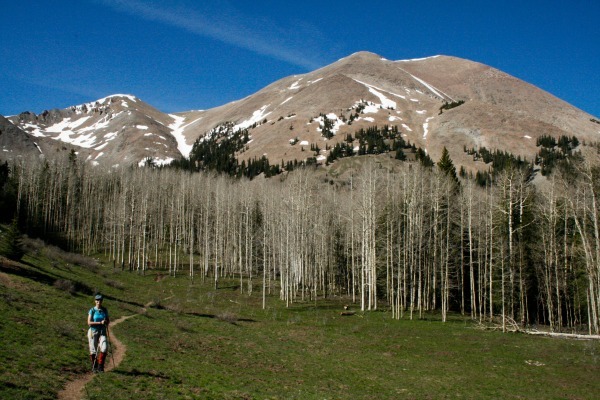 There are a number of hikes in La Sal National Forest. If you happen to be camping at Warner Lake, there are several hiking possibilities directly from the campground. We hiked Mt. Peale during our camping trip on June 1st. It was noon when we arrived at the parking lot after our drive from Colorado and had a quick lunch. Generally we like to hike first thing in the morning to avoid the risk of thunderstorms. But, there wasn’t a cloud in the sky that day. Trail on the Ridge towards the Mt. Peale summit. Mt. Peale via the snow field. South Mtn in the background. Mt.Peale summit looking north toward other La Sal Peaks. There was lots of snow in the wooded areas from La Sal Pass. As it turned out, going late in the day worked out well. The snow was soft so it wasn't icy but still supported our weight. The snow would have been too hard and icy first thing the morning to head up the snow filled gully without crampons. Having so much snow made the hike much easier and faster. Rather than having to scramble up and over all the rocks we hiked up the snow field instead. From Mt. Peale summit looking west towards Mt. Tuk. Lots of loose rock! Many of the hikes on those mountains are difficult and time consuming due to the unstable rocks. The trails are sometimes difficult to follow and often several rocks tend to move with every step. Mt. Peale with a view of the snow filled gully above Hansa to the right. Hiking poles are highly recommended to help with balance. We had a great 4.8 mile (7.7 km) hike and were back at the parking lot in less than 5 hours. But, we do hike fast and conditions that day were ideal. 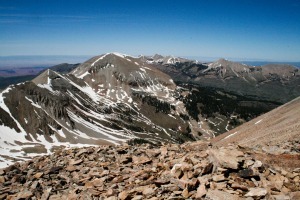 There are several campsites for camping La Sal Pass near the Mt. Peale Trailhead. Besides camping La Sal, we were most interested in driving part of the La Sal Loop Road. We didn’t have time to do the entire 60 mile loop. But, apparently the entire loop is now open all winter. We entered 2 Mile Road from HWY 46 on the south side of the La Sal’s. From 2 Mile Road we explored La Sal Pass and ended up camping along Geyser Pass Road. We had hopes to reach the Geyser Pass Summit but deep snow stopped us several miles before that. Along the road you’ll find new stunning views of aspen groves, pine forests and open meadows around every corner. We continued on 2 Mile Road to Taylor Flats Road, eventually turning on to Pine Ridge Road. 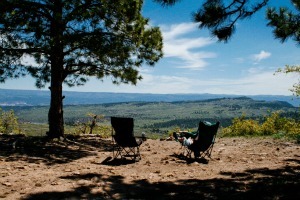 There are plenty of campsites along the top of Pine Ridge Road with great views in every direction! Our campsite off of Pine Ridge Road. An excellent camping La Sal experience! Brown Canyon Road 44 near Gateway, CO.
From there we headed towards Gateway, Colorado on Road 44 which eventually intersects Hwy 141. The route down into Brown Canyon is really STEEP! It would be best to avoid this area if it’s raining or if thunderstorms are nearby. The road winds along the bottom of the canyon where flash floods could happen at any time. A word about Gateway Colorado. Gateway is one of those little known hidden gems. A little green paradise in the middle of no where that has the very fancy Gateway Canyons Resort. The resort is a bit out of our price range but it's nice to see it and visit the area. We love to camp! 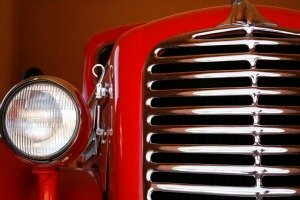 One thing that is definitely worth visiting there is the Gateway Automobile Museum. It is one of the finest collections of classic cars I have ever seen. John Hendricks creator the Discovery Channel is the founder of the museum. Going inside to see all those cars is a real treat on a hot summer's day! Inside the Gateway Canyons Resort. One of many classic vehicles. Note: Gateway probably has the highest cost of gas per gallon we've seen anywhere. As a matter of fact, we didn't see the gas station at the resort anymore. We didn't drive through town so maybe there is a new station there. Regardless, make sure your tank is full before you head that direction. Fueling options are limited. Enjoy your Camping La Sal experience! Click the link to head back to the free camping page from the Camping La Sal page.